This article is about the wooden implement. A typical wooden returning boomerang. A boomerang is a simple implement that comes in various shapes and sizes, depending on its geographic or tribal origin and intended function. The most recognizable type is the returning boomerang, a kind of throwing stick that, when thrown correctly, travels in a curved path and returns to its point of origin. Other boomerangs are of the non-returning sort, and some are not thrown but used in hand-to-hand combat. 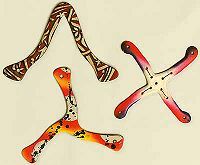 Boomerangs are primarily associated with Australian Aborigines, but they have also been used by various other peoples of the world. Boomerangs can be used as hunting weapons, percussive musical instruments, battle clubs, fire-starters, decoys for hunting waterfowl, and as recreational play toys. 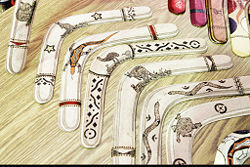 Tribal boomerangs may be inscribed or painted with designs meaningful to their maker. Most boomerangs seen today are of the tourist or competition sort, and are almost invariably of the returning type. The name boomerang comes from the language of the indigenous Australian Turuwal tribe of Aborigines who lived south of Sydney, Australia. The boomerang was also mistakenly referred to as a woomerang, in confusion with the woomera. Boomerangs may be considered the first heavier-than-air flying machines invented by humans. Besides being used by the Australian Aborigines, they have been found among groups of people in North East Africa, Sardinia, India, and the United States (Native Americans in Arizona and southern California). The oldest Australian Aboriginal boomerangs are 10,000 years old, but older hunting sticks have been discovered in Europe, where they seem to have formed part of the Stone Age arsenal of weapons. One boomerang that was discovered in a cave in the Carpathian Mountains in Poland was made of mammoth's tusk and is believed, based on AMS dating of objects found with it, to be about 30,000 years old. King Tutankhamun, the famous Pharaoh of ancient Egypt, who died over 3,000 years ago, owned a collection of boomerangs of both the straight flying (hunting) and returning variety. No one knows for sure how the returning boomerang was first invented, but some modern boomerang makers speculate that it developed from the flattened throwing stick that is still used by the Australian Aborigines and some other tribal people around the world, including the Navajo Indians in America. A hunting boomerang is delicately balanced and much harder to make than a returning one. Probably, the curving flight characteristic of returning boomerangs was first noticed by Stone Age hunters trying to "tune" their hunting sticks to fly straight. As noted above, some boomerangs are used in combat. Boomerangs for sale at the 2005 Melbourne Show. The smallest boomerang may be less than 10 centimeters (cm) from tip to tip, and the largest can exceed 2 meters in length. A boomerang is a rotating wing. 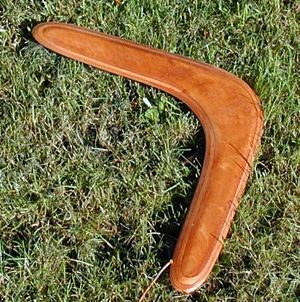 Though it is not a requirement that the boomerang be in its traditional shape, it is usually flat. A falling boomerang starts spinning and most then fall in a spiral. When the boomerang is thrown with high spin, the wings produce lift. Larger boomerangs are used in hunting, thus they drop on the ground after striking the target. Smaller ones are used in sport, and are the only boomerangs that return to the thrower. Because of its rapid spinning, a boomerang flies in a curve rather than a straight line. When thrown correctly a boomerang returns to its starting point. Returning boomerangs consist of two or more arms or wings, connected at an angle. Each wing is shaped as an aerofoil, so air travels faster over one side of the wing than the other. This difference in air speed creates suction or lift along what is roughly a plane which intersects the aerofoil at a near right angle along the long axis of the wing. Gyroscopic precession is what makes the boomerang return to the thrower when thrown correctly. This is also what makes the boomerang fly straight up into the air when thrown incorrectly. With the exception of long-distance boomerangs, they should not be thrown sidearm or like a Frisbee, but rather thrown with the long axis of the wings rotating in an almost-vertical plane. When throwing a returning boomerang correctly it is important to follow the correct instructions to achieve a successful return. Fast Catch boomerangs usually have three or more symmetrical wings (in the planform view), whereas a Long Distance boomerang is most often shaped similar to a question mark. Maximum Time Aloft boomerangs mostly have one wing considerably longer than the other. This feature, along with carefully executed bends and twists in the wings, help to set up an 'auto-rotation' effect to maximize the boomerang's hover-time in descending from the highest point in its flight. Diagram of the throwing of a boomerang. A right-handed boomerang makes a counter-clockwise flight (as seen from above), while a left-handed boomerang is constructed as a mirror image, and circles clockwise. Most sport boomerangs are in the range of about 2.5 to 4 ounces. The range on most of these is between 25 and 40 yards/meters. A right- or left-handed boomerang can be thrown with either hand, but the flight direction will depend upon the boomerang, not the thrower. Throwing a boomerang with the wrong hand requires a throwing motion that many throwers may find awkward. The wings of the boomerang should be at a 15 degree angle from vertical. The other way also works, but many people find it easier to learn this way. The boomerang should be held by the tip using the thumb and one, two or three fingers, and then launched forward quickly while trying more for spin than for very much force. It should flatten out midflight and arc around, sometimes coming to rest a little in front of the thrower or behind the thrower, but ideally it should hover gently and allow the thrower to catch it as a sort of sandwich between the thrower's hands. Returning boomerangs shouldn't be thrown level like a flying disc, as it will turn in the direction of the top of its aerofoils, so if that direction happens to be up rather than to the side it may fly high enough that the landing causes damage to the boomerang or whatever it lands on. Wind speed and direction are very important for a successful throw. A right-handed boomerang is thrown to the right of the wind. Angle to the wind depends on the boomerang, but starting with a 45 degree angle is recommended. Depending on where the boomerang lands, this angle can be modified so that a closer return is achieved. For example, if the boomerang lands too far on the left, throw more to the right of the wind the next time. As for the wind speed, a light wind is ideal. If the wind is strong enough to fly a kite, that's usually too strong for boomerangs. Today, boomerangs are mostly used as sporting items. There are different types of throwing contests, including accuracy of return, aussie round, trick catch, maximum time aloft, fast catch, and endurance. The modern sport boomerang (often referred to as a 'boom' or 'rang'), is made of Finnish birch plywood, hardwood, plastic or composite materials and comes in many different shapes and colors. Most sport boomerangs typically weigh less than 100 grams, with MTA boomerangs (boomerangs used for the maximum time aloft event) often under 25 grams. In 2008, Japanese astronaut Takao Doi verified that boomerangs also function in zero gravity as they do on Earth. He repeated the same experiment that German Astronaut Ulf Meerbold aboard Spacelab in 1992 and French Astronaut Jean-François Clervoy aboard MIR in 1997 both performed. It is believed that the shape and elliptical flight path of the returning boomerang makes it useful for hunting. Noise generated by the movement of the boomerang through the air, and, by a skilled thrower, lightly clipping leaves of a tree whose branches house birds, would help scare the birds towards the thrower. This was used to frighten flocks or groups of birds into nets that were usually strung up between trees or thrown by hidden hunters (Lloyd, and Mitchinson, 2006, 244). Boomerangs (termed "throwsticks") for hunting larger prey, such as kangaroo, were used for small prey as well. These throwsticks fly in a nearly straight path when thrown horizontally and are heavy enough to take down a kangaroo on impact to the legs or knees. For hunting emu, the throwstick is thrown toward the neck, breaking it. It has been documented that Western Victorian "aboriginals" used the returnable boomerang, in addition to hunting, as a means of communication over long distances. This visual communication is especially useful when winds or distance make impossible other well known methods of communication such as cooee. In international competition, a World Cup is held every second year. Modern boomerang tournaments usually involve some or all of the events listed below. In all disciplines the boomerang must travel at least 20 meters from the thrower. Throwing takes place individually. The thrower stands at the center of concentric rings marked on an open field. Aussie Round: considered by many to be the ultimate test of boomeranging skills. The boomerang should ideally cross the 50 meter circle and come right back to the centre. Each thrower has five attempts. Points are awarded for distance, accuracy and the catch. Trick Catch/Doubling: points are awarded for trick catches behind the back, between the feet, etc. In Doubling the thrower has to throw two boomerangs at the same time and catch them in sequence in a special way. MTA 100 (Maximal Time Aloft, field size: 100 meters): points are awarded for the length of time spent by the boomerang in the air. The field is normally a circle measuring 100 meters. An alternative to this discipline, without the 100 meter restriction is called MTA unlimited. Long Distance: the boomerang is thrown from the middle point of a 40 meter baseline. The furthest distance travelled by the boomerang away from the baseline is measured. On returning the boomerang must cross the baseline again but does not have to be caught. A special section is dedicated to LD below. There are many other boomerang disciplines, many played just for fun, but most of these are not considered official competition events. Long distance boomerang throwers aim to have the boomerang go the furthest possible while returning close to the throwing point. In competition the boomerang must intersect an imaginary surface defined as an infinite vertical extrude of a 40 m large line centered on the thrower. Outside of competitions the definition is not so strict and the thrower is happy whenever he does not have to travel 50 m after the throw to recover the boomerang. Long distance boomerangs are optimized to have minimal drag while still having enough lift to fly and return. For this reason they have a very narrow throwing window which discourages many beginners from continuing with this discipline. For the same reason, the quality of manufactured long distance boomerangs is often non-deterministic. Today's long distance boomerangs have almost all an S or ? shape and have all a profile on both sides (the profile on the bottom side is sometimes called an undercut). This is to minimize drag and lower the lift. Lift must be low because the boomerang is thrown with almost total layover (flat). Long distance boomerangs are most frequently made of composite material, mainly glass fiber epoxy composites. The projection of the flight path of long distance boomerang on the ground resembles a water drop. 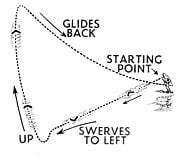 For older types of long distance boomerangs (all types of so called big hooks), the first and last third of the flight path are very low while the middle third is a fast ascent followed by a fast descent. Nowadays boomerangs are made in a way that their whole flight path is almost planar with a constant ascent during the first half of the trajectory and a fairly constant descent during the second half. Throwing technique: The throwing technique is slightly different and less natural as the boomerang must be thrown almost horizontally lied down but aiming high yet with maximal power used. Deceiving exercising: Long distance boomerangs are more difficult to make or to acquire because they must be much more optimized to achieve good performance which requires more workload. On the other hand they are easy to lose because at 100 m only individuals with good vision still see them clearly and sometimes they do not even make the turn and continue straight forward. It also matters that not all fields are big enough, flat and empty to allow exercising. Put apart in tournaments: Due to difficulties to organize competition in this category the events are often separated from the rest of disciplines and scheduled as the last day of the whole tournament, often a Monday. On the other hand, as long distance throwers are few compared to those in other disciplines, they benefit from a family spirit during LD events. Kylie is one of the Aboriginal words for the hunting stick used in warfare and for hunting animals. Instead of following a curved flight path, it flies in a straight line from the thrower. They are typically much larger than boomerangs. It can travel very long distances, and due to its size and hook shape can cripple or kill an animal or human opponent. The word is perhaps an English corruption of a word meaning boomerang taken from one of the Western Desert languages, for example, the Warlpiri word karli. ↑ Tony Butz, What is a Boomerang? Boomerang Association of Australia. Retrieved January 14, 2009. ↑ Culturequest article about Boomerangs. Culture Quest. Retrieved January 14, 2009. ↑ 3.0 3.1 Oblazowa Cave Finds. oblazowa.pan.krakow.pl. Retrieved January 14, 2009. ↑ 5.0 5.1 5.2 Boomerang History. rangs.co.uk. Retrieved January 14, 2009. ↑ Battle Boomerangs. How Stuff Works. Retrieved January 14, 2009. ↑ Ted Bailey, Worlds Largest Boomerang. www.flight-toys.com. Retrieved January 14, 2009. ↑ Boomerang plans. baggressive.com. Retrieved January 14, 2009. ↑ Boomerang works in space, says astronaut. news.com.au. Retrieved January 14, 2009. ↑ Does a Boomerang Work in Space? Universe Today. Retrieved January 14, 2009. ↑ Boomerangs in Space. flight-toys.com. Retrieved January 14, 2009. ↑ What is a boomerang and where does it come from? bumerang-sport.de. Retrieved January 14, 2009. Jones, Philip. 2004. Boomerang: Behind an Australian Icon. Kent Town, AU: Wakefield Press. ISBN 1862543828. Lloyd, John, and John Mitchinson. 2006. The Book of General Ignorance. London, UK: Faber and Faber. ISBN 9780571233687. Mason, Bernard S. 1974. Boomerangs - How To Make And Throw Them. New York, NY: Dover Publications; London, UK: Constable. ISBN 9780486230283. Unspinning the Boomerang – The Maths and Physics of a Boomerang. Boomerang aerodynamics – an online dissertation. What is a Boomerang? - Boomerang Association of Australia. This page was last modified on 17 June 2016, at 16:04.